Prismatic Solid is a vertical scrolling shmup that doesn't even bother with a storyline. You move forward and the enemies rain bullets down on you through five stages. And when I say rain, I truly mean rain, with some enemies literally filling the screen with bullets. To aid you, your ship has six different weapons, such as homing bullets and three-way shots, and three colored shields that change their position depending on what weapon you select. Instead of power-ups for your weapons like in most shooters, enemies drop power-ups that make your shields larger, and you can use part of your shields as a sort of smart bomb when you're in trouble. The first thing you'll notice about Prismatic Solid is that the game looks and sounds good. Like, professional good. Not too surprising since the game's presentation is the result of some of the team that did Ridge Racer and Bushido Blade. It's colorful, bright, and looks a bit like what would happen if someone took classic shmup Viewpoint and turned it into a vertical shooter with a bit of a visual update. It's a welcome change from the retro style that's been pretty popular lately. In fact, everything looks too good at times, making it difficult to see what does and doesn't need to be dodged. The soundtrack for the game is easily my favorite thing about it, with a healthy blend of upbeat techno infused with a touch of funk. Again, reminds me a lot of Viewpoint, and that's definitely a compliment. Controls for the game are as solid as the presentation. LB and RB cycle through your six weapons, left analog moves you like it should, and the A button fires your weapon. The other three face buttons activate your shield sweep, each one using a different one of your three shields (B for red, X for blue, and Y for yellow). Everything is responsive, though with six weapons that get cycled through one at a time it takes a bit getting used to before you remember the order and shield position of each weapon. So, everything so far has been pretty kind toward Prismatic Solid. Unfortunately, that has to stop here. The neat mechanic of the three buildable shields actually becomes a bit overpowered and boring when certain weapons make a shield formation that, quite literally, envelops you. So once this happens, the only thing you need to worry about is running into things. Which you probably will during a couple stages, but with extra lives given out every 30,000 points (not much) you might find yourself never running out of lives once you learn each stage. Without much of a challenge and without any score multiplier or co-op, the game becomes somewhat stale after a little while. 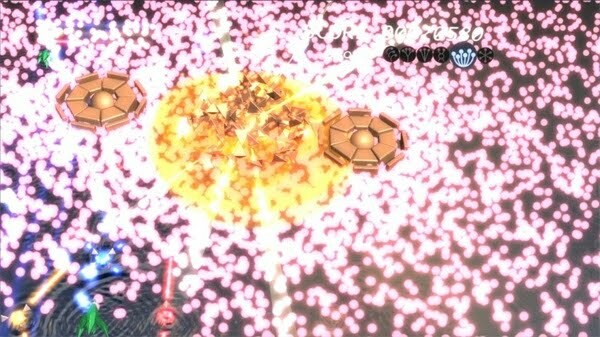 The game does combat this a little bit with each successful completion of the game's five stages bringing you back to the start with slightly more difficult bosses and enemies, but even then it just feels like a challenge to see how long before you lose interest rather than your last ship. All this sounds a little harsh for a game that looks and sounds amazing, is only a dollar, has solid play, and is fun for a little bit. And I have to admit it wouldn't be too bad to zone out to when you're not looking for much of a challenge. But when it comes down to it Prismatic Solid loses its charm and challenge within 10-15 minutes of when you press start and, aside from a couple cheap rising wall moments in the later stages, never gets it back. In the end, it's a textbook example of how bad balance can ruin an otherwise decent game. Prismatic Solid from heloli is available on XBox Live for 80 MS Points. Played through twice, was on my way to a third completion before I gave up to do something else.